This is the most important article that I have ever written for this blog. It was also the most difficult to write. Exactly one year ago today, I published this post, and as I sit here reading it today, I get a lump in my throat and tears are streaming down my face. I remember the day this happened like it was yesterday. I remember the swimsuit my son was wearing…it was black and red and had “Cars” characters on the rash guard and trunks. To this day, I am terrified of children drowning…my children, the children of my friends and family, and all of the precious children I am honored to care for in my practice. If I could pick one of my postings for every parent to read, without question, this would be it. Read it, share it, and if one life is saved, I have achieved my goal. It was our first swim of last summer. Mr. J (3 at the time) and Miss M (2 at the time) could hardly wait. They had gotten suited up and each had waited their turn to get their sunscreen applied. During their “wait time” to let the sunscreen soak in, Miss M was sitting right next to me on the porch while Mr. J wanted to sit on the top step of the pool and make “handprint art” with the pool water. Standing about 10 feet from the pool steps, I applied my own sunscreen and was a bit distracted by Miss M explaining something about her princess pool toys for all of about 15 seconds or so. And when I looked back to check on Mr. J, he was no longer on the step. As panic set in, the adrenaline immediately kicked on, my mind slipped into the slow-mo that only happens in dire emergencies, and I noticed the tips of his fingers wiggling just above the surface of the water. He had silently (and I do mean, truly, without a sound) slipped off the step into 3 feet of water, with me standing less than 10 feet from him. As slow-mo continued, it felt like an absolute eternity to cover that short distance as my legs couldn’t move fast enough to get to him. And I will never forget the look on his face when I got to the pool steps and started down to grab him. It was utter helplessness…he was looking up at me with eyes wide open, panic stricken. I pulled him out of the water, and thankfully (gloriously) he was screaming. I was very lucky. For a number of reasons, even though it has been a year since this occurred, I haven’t really talked much about this story before this posting - and certainly not with this degree of detail. Not even to my husband, who wasn’t out by the pool with me at that moment to witness this…feel this himself. To start with, I had nightmares for weeks about what happened, and to this day, as I remember the vivid detail of that moment, I get that same terrible feeling in the pit of my stomach that makes me want to vomit as the tears start welling up in my eyes. Next, I am a pediatrician…I know the statistics about drowning backwards and forwards. In fact, I did a project on drowning prevention during residency for goodness sake. I have extolled the importance of watchfulness, life vests, proper fencing, locked doors to the patio, and all the rest to parents for years. And during my residency, I saw first hand what can happen when parents aren’t as lucky as I was on this particular day. In short, this simply shouldn’t happen to me and my family. But it can happen to anyone, no matter the amount of knowledge you have or how prepared you think you are, all it takes is mere seconds for this to happen. And if hearing this story keeps one child safe, then my job is done. To be clear, when a child is drowning, they will not splash around or make much noise, especially the younger they are. Their body is just not physically able to get to the top of the water to flail around let alone scream or utter enough noise to get anyones attention when they are in trouble in the water (Mr. J was 3 and a half, and this was exactly what happened - silence.) Submersion takes less than 10 seconds to occur, while a child can lose consciousness in 2 minutes, and they can suffer permanent brain injury in 4-6 minutes. While drowning in swimming pools and lakes probably gets the most attention, a child - especially infants - can drown in as little as one inch of water, which means the bathtub, a bucket of standing water, or a kiddie pool. 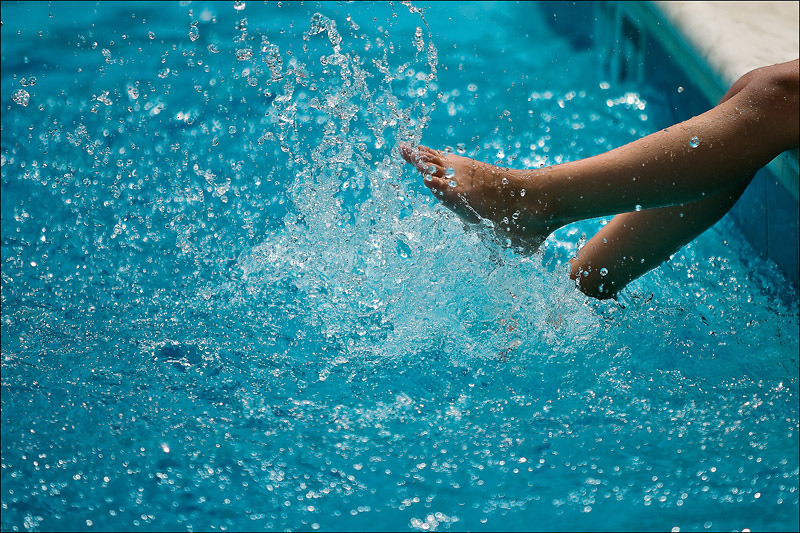 The best way to prevent drowning, and really to simply keep your kids safe from all sorts of water-related injury, is through ACTIVE adult supervision. An adult who knows how to swim should be within arms reach, or touch supervision, of a child anytime they are in the water. If there are multiple adults around while children are swimming (for example, at your backyard Fourth of July pool party), have a designated “Water Watcher.” This adults sole job is to be in charge of ALL of those swimming, paying attention to the entire pool as a lifeguard would do, and not distracted by television, cell phones, involved in other conversations away from the pool, or drinking alcohol. (Aside: I emphasized and bolded “ALL” in the prior sentence because most parents with young children will focus on their kids. They have a tendency not to notice what’s happening with other children because of this and it can be easy to miss something bad happening elsewhere in the pool in this mode. They are not serving as a designated “Water Watcher” when in this mode - and please do not allow yourself to fall into this trap thinking that a bunch of parents watching their kiddos in the water make up for not designating this key role.) This “Water Watcher” responsibility can be rotated through the adults in 15 minute increments. You can even download “Water Watcher” cards by clicking here, so that the designated person has something tangible to remind them of their duty. And, of course, if it is a big party with lots of young kids and/or there will be a lack of parents around, hire a professional. Lifeguards can be found from lots of pools and clubs around you, and as a place to start if you’re in the Baton Rouge area, Crawfish Aquatics offers this service. Swimming pools should be surrounded by a four sided fence that is at least 4 feet high. The fence should have a gate that opens outward and is self-latching and self-closing. Remove all pool toys from the pool area once you are done swimming for the day. What could be more tempting for a young child than a brightly colored beach ball or a pool noodle floating in the water? Suction from drains poses an entrapment risk so make sure that all drains have appropriate covers on them. Also, avoid loose pieces on clothing and tie back long hair in children to avoid these things getting sucked into drains. Finally, what about the role of swimming lessons? For children 4 years of age and older, there is no question that they should have formal swim training as soon as possible. Previously, the American Academy of Pediatrics recommended AGAINST swimming lessions in children under 4 years of age. However, several small newer studies have shown that swim lessons for those 1-4 years of age may lower the risk of drowning. The decision to enroll a child under 4 in swimming lessons should be made based on their developmental readiness as well as their exposure to water (i.e. if you have a pool, pond, lake, or other waterway in your backyard or near your home, the sooner the better). There is no evidence at this time that swim instruction or survival skills can prevent drowning in infants under 1 year of age. In the end, no matter a child’s age or the number of swimming lessons they have had, no child is “drown-proof” and parents should not view formal swim training as a guarantee that a child will not drown. The event last summer with Mr. J left not only an impact on Mommy, but on him as well. When we talk about swimming, he often tells me that he doesn’t want to go underwater and “be really scared” again. So, we have some new rules when it comes to swimming in our house…No one is allowed to touch the water until an adult is in the pool. We also started swimming lessons this week. It’s funny…the owner of the swimming school was talking to the parents on the first day of class explaining how so many children drown each year after they slip into the pool from the steps. She described what typically happens - silence, less than 10 seconds, even staying vertical and very near the edge or stairs when they slip into the water and then immediately sink. It was like she was telling me the story of Mr. J. Unfortunately, I think my story is all too common and often has a very different outcome. I know we were lucky, and I hope reading this post today will help to keep at least one other child - your child perhaps - safe during this upcoming summer swimming season. This really hits home Dr. Calandro, thank you for sharing your personal story. I hope that us parents and care givers can learn from this and we can all become proactive in this situation.